Monday to Friday: 8:30am to 5:00pm with closing on Wednesdays at 1:00pm. Click here for the detailed map on mapquest.com to the new office location at 122 Timberhill Place, Chapel Hill. 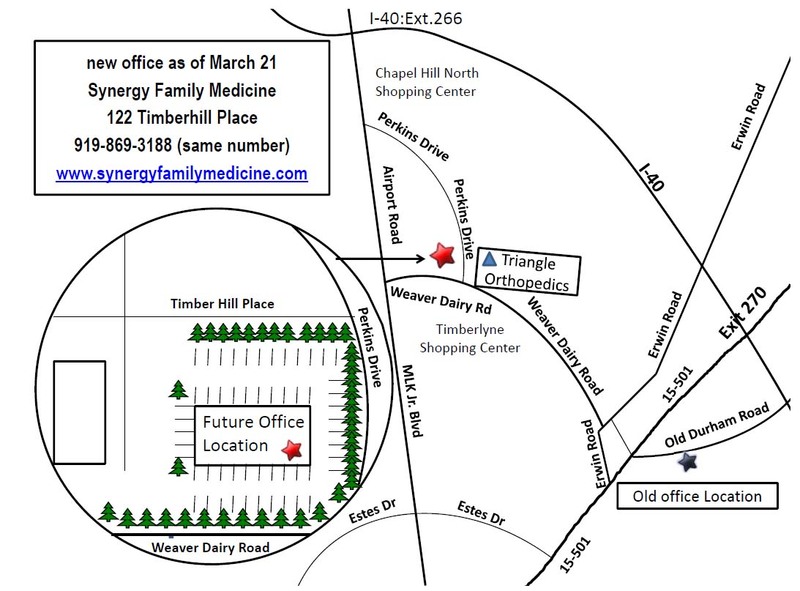 Directions to Synergy Family Medicine at 122 Timberhill Place near Chapel Hill North. FROM THE EAST: Take I-40 West (from Raleigh and Durham) to Exit 266 (NC-86 South). Take a LEFT off the exit. NC-86 South becomes Martin Luther King Boulevard (Historic Airport Rd). At the second traffic light make a LEFT onto Perkins Drive by Chapel Hill North Shopping Center. Continue on Perkins Drive and make a RIGHT onto Timberhill Place (this will be the second right turn on Perkins Drive). Make your next left. Synergy Family Medicine will be on your left. Please take the stairs or the elevator to the second floor. FROM THE WEST: Take I-40 East (from Greensboro, Burlington, Hillsborough) to Exit 266 (NC-86 South). Take a RIGHT off the exit. NC-86 South becomes Martin Luther King Boulevard (Historic Airport Rd). At the second traffic light make a LEFT onto Perkins Drive by Chapel Hill North Shopping Center. Continue on Perkins Drive and make a RIGHT onto Timberhill Place (this will be the second right turn on Perkins Drive). Synergy Family Medicine will be on your left. Please take the stairs or the elevator to the second floor. FROM DOWNTOWN CHAPEL HILL: Take Martin Luther King Blvd. east (down the hill). At the light AFTER the intersection of Martin Luther King Boulevard and Weaver Dairy make a RIGHT onto Perkins Drive by Chapel Hill North Shopping Center. Continue on Perkins Drive and make a RIGHT onto Timberhill Place (this will be the second right turn on Perkins Drive). Make your next left. Synergy Family Medicine will be on your left. Please take the stairs or the elevator to the second floor. FROM 15-501 IN CHAPEL HILL: you may take Ervin road, then take a LEFT at the first traffic light onto Weaver Diary road; or you may take Page road from 15-501, take first LEFT to Ervin road, then first RIGHT onto Weaver Diary road. Drive about half a mile on Weaver Dairy road, right after you pass Timberlyne Shopping center on your left hand side, turn RIGHT onto Perkins Drive by Triangle Orthopedics. Drive 200 yards and take the first LEFT onto Timberhill Place. Make your next left. Synergy Family Medicine will be on your left. Please take the stairs or the elevator to the second floor. FROM DURHAM ON 15-501: Take 15-501 South towards Chapel Hill. Take I-40 West towards Greensboro to Exit 266 (NC-86 South). Take a LEFT off the exit. NC-86 South becomes Martin Luther King Boulevard (Historic Airport Rd). At the second traffic light make a LEFT onto Perkins Drive by Chapel Hill North Shopping Center. Continue on Perkins Drive and make a RIGHT onto Timberhill Place (this will be the second right turn on Perkins Drive). Make your next left. Synergy Family Medicine will be on your left. Please take the stairs or the elevator to the second floor.